vector it used bright colors and added some highlight. Evening scenery is my first Idea and I really made it. The layers are about 170, and I made another stuffs like the fallen leaves and flowers in the separated files, btw the doves are the same doves i use for my previous clannad wall. That's really pretty ^^ I think the sunset look goes well with the characters and the colours you've got there. I just love your background! It's amazing and the vector too ^^ Good job. :) By the way, you collab for this wallie? lovely windy scene.i like it. CLANNAD after all ! it's one you use often in your walls. I love the clouds mostly, how it wraps around the bg and gives it a nice perspective. The flowers are a nice touch, not too much which is perfect and the trees are great looking too. they're bright as it is but they need that bright sun glow on them. a very pretty & peaceful wallie! 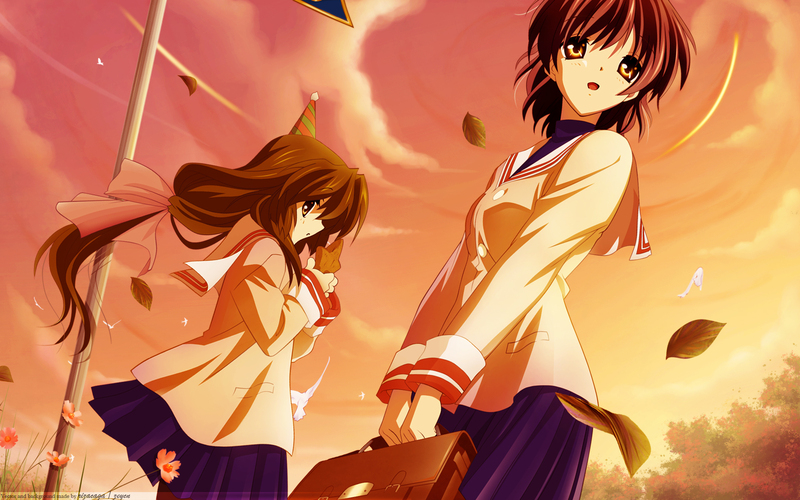 love clannad. This is very nice. I ve always love these kinda of bg. The vector is very neat (though the green leaves may need some more blending and the flowers stand out just a bit too much) and I absolutely love the colors. One of your best, by far! Can you do a tut on how you do the trees/bushes? Wow! I really like the way the angle and the colors! Not only this but also a few of ur works! Keep it up!